Melanie Biskup has been a member of Team LUNA Chix Tulsa mountain bike team since its inception in 2009. How did I find out about Team LUNA Chix? Easy. My persistence with doing random searches and such on the internet trying to find women involved with bike riding! Honestly, a lot of the women I'm talking to are from me reaching out to organizations, groups, etc. and just hoping that someone will find my blog worth contributing to. I am familiar with LUNA as we carry the LUNA bar products at the co-op I work at. I found a website somewhere and saw a bunch of women wearing LUNA jerseys. I then found out that LUNA had several groups of women athletes, so I reached out. Simple as that! I started riding a bike when I was probably 5 or so on the small bike that got passed around our neighborhood for each kid to learn on. After you got proficient enough, hopefully your parent, like mine would buy you your own bike to ride around the neighborhood, in Tulsa and get back and forth to your friends house or to school. I really gained my independence in my teens when I was given a Schwinn Varsity 10 speed and allowed to ride with my best friend wherever we wanted to go. I learned orientation, how to figure out directions, and how get somewhere and get back home. I loved the feeling of independence riding and seeing new places gave me. This same feeling is really what motivates me today and seeing things from the seat of my bicycle at 15 mph is the best way. I also love sharing this feeling with like minded people that join me on my rides. 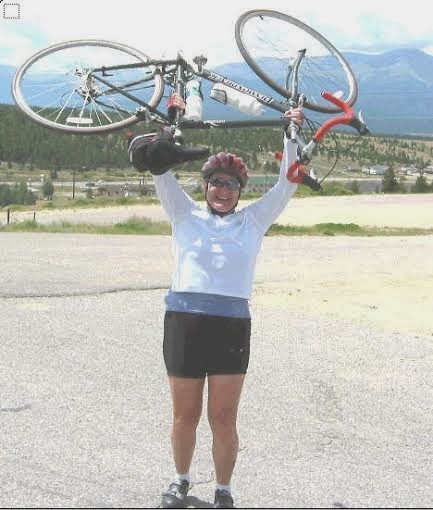 I've been seriously riding my road bike since 1998 and have done several cross state rides each summer. Those would include the week long Oklahoma Freewheel, Colorado Ride the Rockies, and the Bicycle Tour of Colorado. But in 2005 I bought a mountain bike and started riding trails for the first time in my life. Boy was it hard to get comfortable when you're so used to riding smooth paved roads. I've continued to work on my mountain bike skills and have really learned to love the off road for its challenges and ever changing scenery. I do give much credit to the women of LUNA Chix that have helped me learn without expectations, competition, or judgement. I remember that it was very scary when there were any obstacles to ride over such as rocks, roots, or sand. I did love being on new trails and seeing nature in a different way, but it took some time to feeling comfortable not on paved roads. I walked quite a bit when I was first learning the mountain bike when I came to things I thought were difficult. I have overcome some of that by just riding more and gaining confidence that I can ride over or through such difficulties. 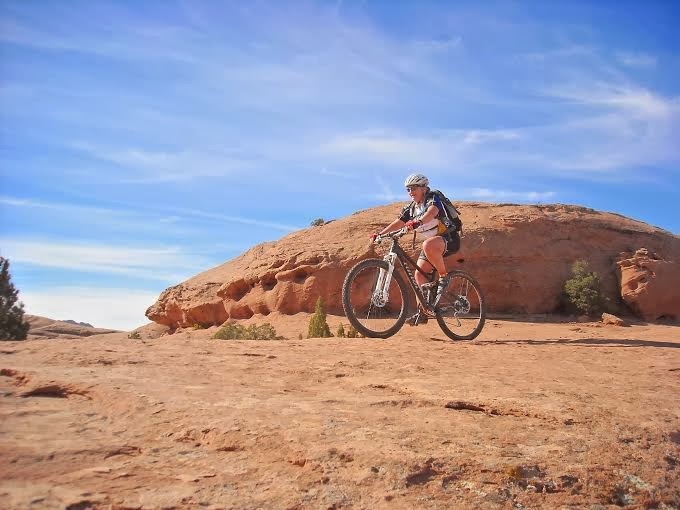 I also have attended several mountain bike skills clinics and have learned a great deal about how body position is very important in conquering these obstacles. ---I asked Melanie to share a bit more about the skills clinics, being I've never attended anything similar to one. I have attended one professional mountain bike skills clinic that was put on here in Tulsa by the Better Ride people from Durango, CO. Their instructor was very knowledgeable and good at teaching core skills and answering questions based on his long time experience in riding and racing. I would highly recommend the three day camp to anyone no matter their skill level. Our Luna Chix team has had a skills clinic for women only for the last three years. We've also been very fortunate to have two different pro mountain bikers from the LUNA pro team join us the last two years. They along with our team have lead the instruction which in usually focused more on beginner women. Our Tulsa LUNA team has also attended an annual Team LUNA Chix summit in Berkley, California for the last three years, where we learn about our responsibilities as a Team LUNA Chix team, LUNA nutrition products and ride with the LUNA pro team. This has been the most exciting experience to learn from such tremendous athletes that have won their national championships as well as World Cup Races and been to the Olympics. We also have the privilege to ride and learn from these professionals in the Red Wood forest east of the Bay Area, beautiful. I have used clipless pedals for a long time since I started using them when I started riding my road bike seriously. It was a much easier transition to use them on the mountain bike but did take some getting used to when you become off balanced and start to fall on the trail. I have certainly had my fall overs when I couldn't get my feet unclipped, but I really like the ability to use the full range of motion when pedaling that being clipped in provides. ---I asked Melanie if she had any other suggestions for clipless pedals for mountain biking and getting adjusted to them. As far as clipless pedals, I would probably recommend using flat pedals when first learning to mountain bike. Then I would recommend using clipless pedals after you feel comfortable with your balance and are riding for longer periods of time. I don't really commute much, but I would guess that the biggest challenge when I do is finding a course that keeps me off the most busy streets and away from speeding traffic. acle. Luckily these crashes have not been so that I could not return to riding immediately either. They sometime make me more cautious but usually make me want to become a better rider. I love the feeling of the physical exercise I get from riding my bike, but I really love the comradery that I get from sharing such fun experiences with my good friends when I'm on my bike. I became involved with Team LUNA Chix after LUNA decided to sponsor our existing women's mountain bike group we called the Bomb, Babes on mountain bikes. As a sponsored team we are asked to lead two women only mountain bike rides a month, put on two clinics a year, distribute LUNA bars, and raise money for the Breast Cancer Fund. In return we receive a team kit and some other perks provided by LUNA. We are not a race team although some of the women on our team do race. Check out the www.teamlunachix.com and read about all the team LUNA sponsors including their pro team.